Discussion in 'Chicken Behaviors and Egglaying' started by Chickens n' more, Aug 7, 2009. Look what my EE surprised me with today. This has to be the largest egg I have ever seen come out of a chicken! The one on the left is a BR egg weighing 21.5oz and the one on the right is a RIR egg weighing 26 oz. I have no idea what the EE egg weighs. My scale only goes to 32 and it was maxed out! In this pic, the RIR egg is 30 oz. Until today, my RIR held the record. 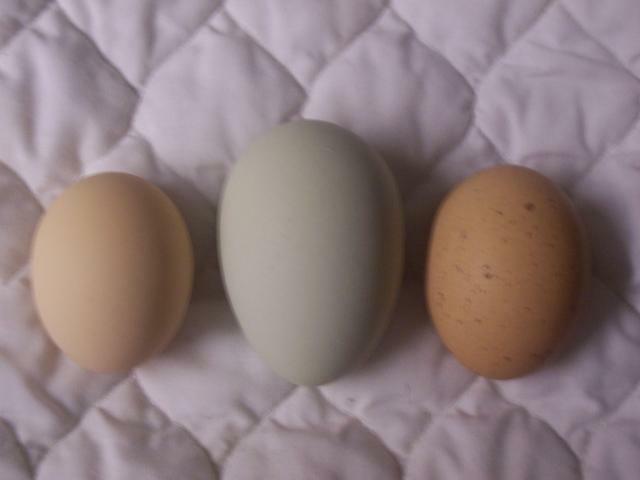 I have 2 EE hens and without fail, every single day, I get 2 beautiful green eggs. But never such big ones! See if its a double yolker!! crack it open!! That's a big one-gotta love that girl! You don't really mean "ounces", right? If you did, it should go in a record book ! Okay, had to waste an egg....LOL. Poor little girl! Quote: ....I obviously DO NOT HAVE A CLUE how to read this antique scale! Please explain if you can...here's a pic. Are the numbers on the bottom ounces? If so, then what are the top bigger numbers? Okay, a little slow, but I got it!! The bottom is single eggs and the top numbers are ounces per dozen!! Ha! How funny....you read it fine. It is ounces on the bottom and on the top. The top numbers show you how much a dozen eggs that size will weigh (note the doz on the far left). The bottom number is the weight of each egg. What a cool scale!!!! I agree, that is a really cool scale!! I would've been confused too.